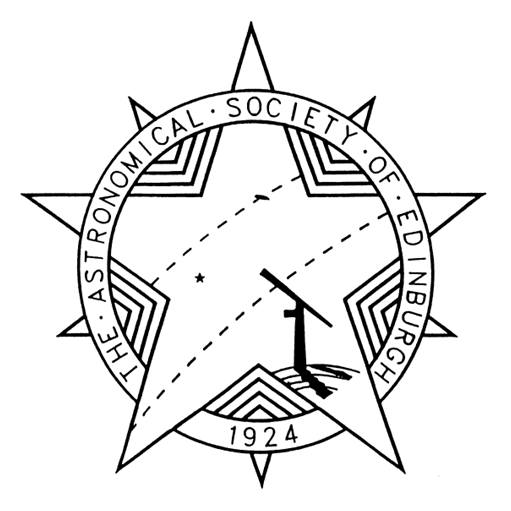 May is seldom an outstanding month for astronomy for observers at Scotland’s latitudes. The Sun’s northwards progress, welcome as it is, leads to later and briefer nights and, as the month ends, twilight begins to persist throughout the night even over the south of the country. Two astronomical events occur this May, though, that should arouse our interest. The first is the transit by Mercury across the Sun’s face on the 9th which, if the weather holds, should be our best opportunity until 2049 to view its inky silhouette against the Sun. The month also sees Mars approach closer to us and appear brighter than at any time since 2005. I must repeat the usual serious warning about the dangers of observing the Sun. To prevent permanent damage to your eyes, never look directly at the Sun through a telescope or binoculars, or even stare at it with the unaided eyes. We may project the solar image onto a shaded white card using a pinhole, binoculars or a small telescope, but note that using a large telescope for this may damage its eyepiece. Sadly, Mercury’s outline will be too small to view by pinhole-projection, and nor will we see it using so-called eclipse glasses. In my opinion, though, it is best to equip your telescope with a certified solar filter to cover the objective (“big”) end of your instrument and block all the harmful radiation. The precise times we experience the transit can vary by a couple of minutes across the Earth. For Scotland, Mercury begins to encroach on the eastern (left) edge of the solar disk at 12:12 BST and it takes a little more than three minutes before its outline is complete against the Sun. After crawling across the southern half of the Sun it finally leaves at the south-western (lower-right) edge at 19:41. At a mere 12 arcseconds in diameter, though, it appears only 1/150th as wide as the Sun and a fifth as wide as did Venus during its transit in 2012. Whereas there are more than a dozen transits of Mercury each century, the next one by Venus is not until 2117 and we must be patient until 2125 for the next to be observable from Scotland. The Sun climbs 7° northwards during May as sunrise/sunset times for Edinburgh change from 05:28/20:53 BST on the 1st to 04:36/21:46 on the 31st. The Moon is new on the 6th, at first quarter on the 13th, full on the 21st and at last quarter on the 29th. Other than during its transit, Mercury is not visible for us at all this month, and neither is Venus which is lost in the glare on the Sun’s far side. Jupiter, though, remains prominent in the heart of our southern sky at nightfall where it is slow moving in southern Leo and reaches a stationary point on the 10th before edging eastwards again. May has it dimming slightly from magnitude -2.3 to -2.0 as it recedes from 723 million to 791 million km and its disk shrinks from 41 to 37 arcseconds in diameter. Catch it near the Moon on the 14th and 15th. By our star chart times, Leo and Jupiter are sinking into the west and our southern sky is dominated by the bright star Arcturus, the equally bright planet Saturn and, most conspicuous of all, the Red Planet, Mars. 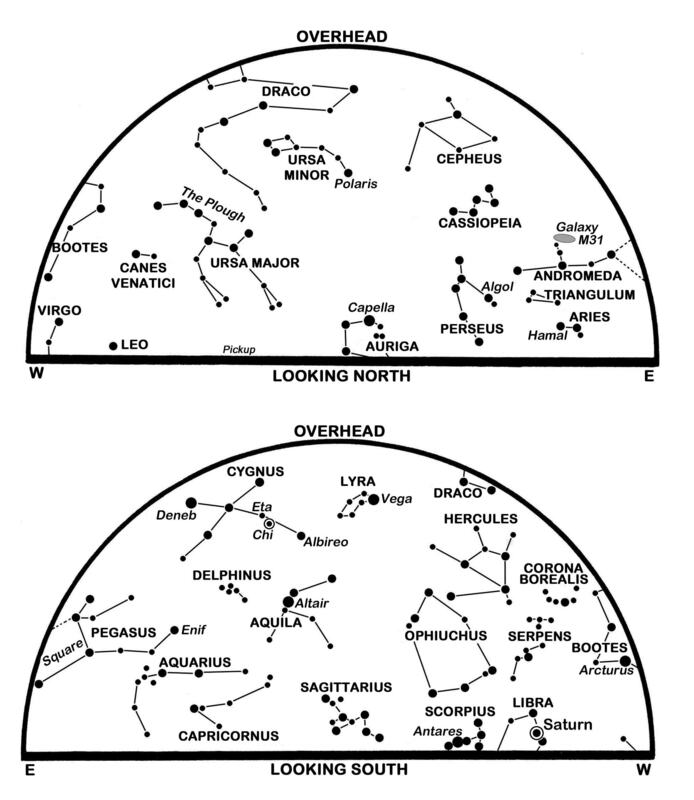 The Plough is tumbling westwards from the zenith as the Summer Triangle formed by the bright stars Vega in Lyra, Deneb in Cygnus and Altair in Aquila, occupies our lower eastern sky. Mars rises in the south-east at 23:14 BST on the 1st and at sunset on the 22nd, the day it stands directly opposite the Sun in the sky at opposition. Our chart plots it low down in the south-south-east about one hour before it reaches its highest point, albeit less than 13° above Edinburgh’s southern horizon. It lies 5° above the red supergiant star Antares in Scorpius at present but is retrograding, or moving westwards, against the stars and enters Libra towards the end of the period as it brightens from magnitude -1.5 to rival Jupiter at magnitude -2.0 at opposition. Because it is on the inwards leg of its somewhat eccentric orbit, it is actually closest to us at 75,280,00 km on the 30th, almost a million km closer than on the day of opposition. Mars’ low altitude means that views of its reddish disk, only 18 arcseconds wide at opposition, may be less sharp (under “poorer seeing”) than if it stood high in the sky. Even so, telescopes should show the small northern polar cap, tipped 10° towards us, and other surface features as they drift slowly to the right across the disk. Those features return to almost the same position from one night to the next since Mars’ day is 40 minutes longer than that of the Earth. Mars comes 17 million km closer during its next opposition in 2018, but will be 4° lower still in our sky so we should make the most of any chance to view it this time around. Shining to the east (left) of Mars is Saturn which this month brightens from magnitude 0.2 to 0.0 as it creeps westwards in southern Ophiuchus. It always rewards us with stunning telescopic views, its disk being (like Mars) 18 arcseconds wide but set within a glorious ring system that spans 41 arcseconds and has its north face inclined towards us at 26°. Look for the Moon above Mars late on the 21st and closer still to Saturn on the next night. This is a slightly-revised version of Alan’s article published in The Scotsman on April 30th 2016, with thanks to the newspaper for permission to republish here. The Summer Triangle, formed by the bright stars Vega, Deneb and Altair, still has pride of place high in our southern sky at nightfall. Mars and Saturn are visible on our September evenings, too, but we must look low in the south-west to catch them. Both are well past their best and less interesting telescopic targets than Jupiter which is now resplendent in the east before dawn. Having swept 3°, or six Moon-widths, to the south of Saturn on 27 August, Mars has a trio of further notable encounters later in September. Two new spacecraft, NASA’s MAVEN and India’s MOM or Mangalyaan, are on course to enter orbit around Mars on the 21st and 24th respectively while the planet is due to pass 3° north of the enormous red supergiant star Antares in Scorpius on the 27th. The name Antares comes from the Ancient Greek for “rival to Mars” and, while they may indeed be similar in brightness by the month’s end, it will be fascinating to see how their colours compare. Meanwhile, Mars, or rather the spacecraft in orbit around it, are due for a more challenging encounter when the icy nucleus of comet C/2013 A1 Siding Spring sweeps within some 130,000 km of the planet on 19 October. The operators of NASA’s Mars Reconnaissance Orbiter and Mars Odyssey, and of Europe’s Mars Express, are arranging to shield their craft from the worst of the dust storm that is likely to be accompanying the comet, and similar precautions may be needed for MAVEN and MOM. In other space news, Europe’s Rosetta craft is now studying five potential landing sites for its Philae lander on the nucleus of Comet Churyumov-Gerasimenko. The landing is not due until November, but it is planned to choose a primary and a backup site this month as Rosetta closes to with 30 km of the nucleus. 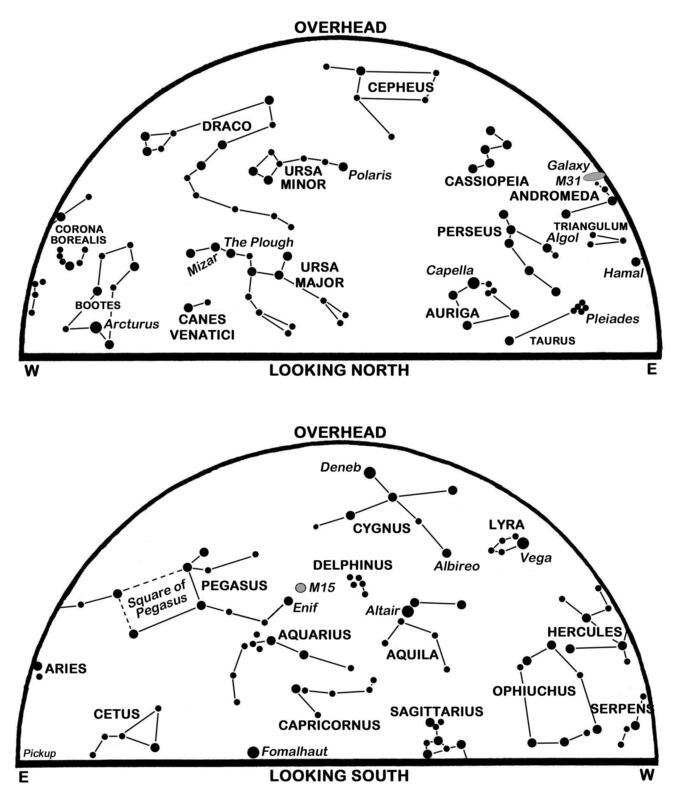 By our star map times, the Summer Triangle lies just west of our meridian as it gives way to the stars of autumn led by the topsy-turvy winged horse Pegasus whose nose is marked by the star Enif. Use binoculars to look 4° north-west of Enif for the star cluster M15 which appears as a fuzzy blob less than half as wide as the Moon. 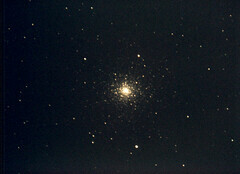 In fact, it is one of the finest globular clusters in the sky and contains more than 100,000 stars at a distance in excess of 30,000 light years. The Sun tracks 11.5° southwards in the sky during September and crosses the equator at 03:29 BST on the 23rd, the time of this year’s autumnal equinox. Sunrise/sunset times for Edinburgh change from 06:17/20:07 on the 1st to 07:13/18:51 on the 30th as the duration of nautical twilight at dawn and dusk falls from 89 to 80 minutes. The Moon is at first quarter on the 2nd, full on the 9th, at last quarter on the 16th and new on the 24th. As the full moon nearest to the equinox, the one on the 9th is also our Harvest Moon and, since it comes less than a day after the Moon is closest to the Earth, it is yet another supermoon. Saturn stands about 11° high in the south-west and only 0.3° above the northern tip of the crescent Moon as the evening twilight fades on 31 August, with Mars another 4° below and to their left. On 27 September, the young Moon returns to lie 6° to the right of Saturn which, by then, is 4° lower in the sky and becoming hard to spot in the twilight. Both planets begin the period at magnitude 0.6, but Mars dims slightly to magnitude 0.8 by the 29th when it stands 5° below the Moon and 3° above Antares. It is also 20° to the left of Saturn and drops below Edinburgh’s horizon at 20:51 BST. Viewed through a telescope, Mars is only 6 arcseconds in diameter at midmonth, while Saturn is 16 arcseconds wide within rings that span 36 arcseconds and have their north face tilted 22° towards us. After Mars and Saturn set, the sky is devoid of bright planets until Jupiter rises more than five hours later. 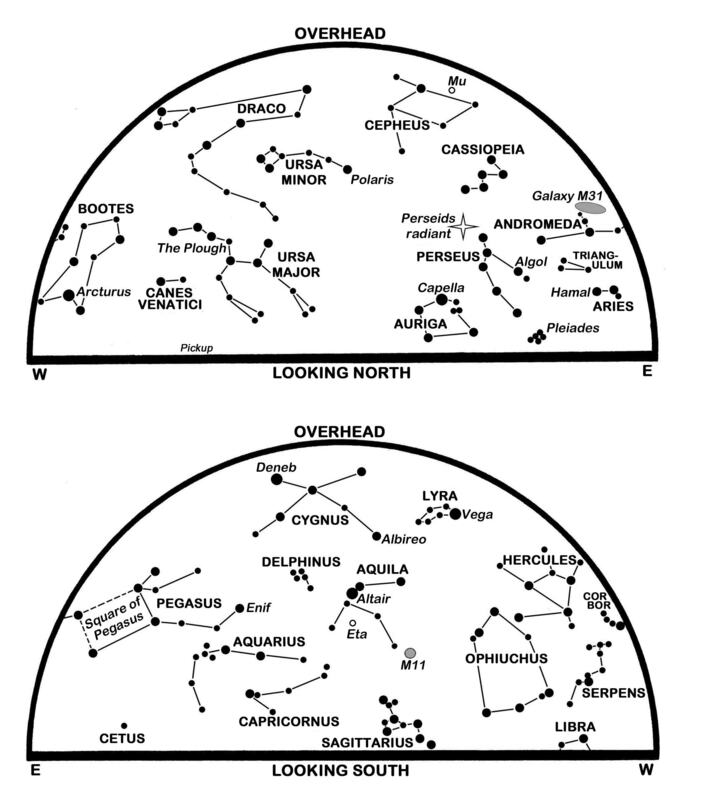 True, Neptune and Uranus are binocular objects at magnitudes of 7.8 and 5.7 in Aquarius and Pisces respectively, but we need better charts to identify them. There is no mistaking Jupiter, though. The conspicuous giant planet rises at Edinburgh’s east-north-eastern horizon at 03:29 on the 1st and by 02:07 on the 30th. climbing well clear of the eastern to south-eastern horizon by dawn. 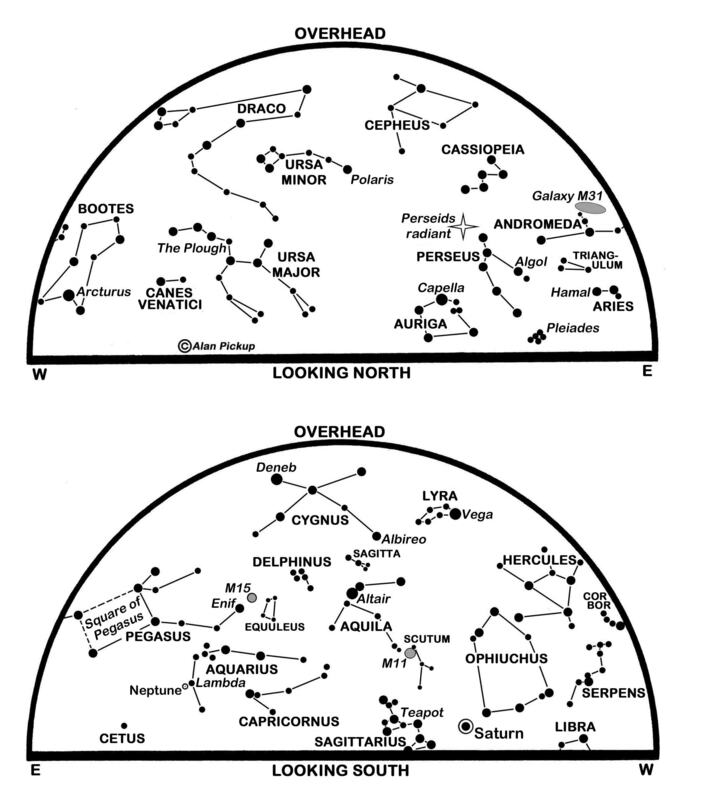 As it brightens slightly from magnitude -1.8 to -1.9, it also tracks 6° eastwards, below and away from the Praesepe or Beehive star cluster in Cancer. Look for the waning earthlit Moon 6° below and right of Jupiter before dawn on the 20th. Viewed through a telescope on that morning, the cloud-banded Jovian disk is 33 arcseconds across. Venus is also a morning object and, although it remains brilliant at magnitude -3.9, it is sinking deeper into the twilight as it approaches conjunction on the Sun’s far side in October. On the 1st, it rises 87 minutes before the Sun and stands 14° below and left of Jupiter as it climbs 12° above our eastern horizon by sunrise. Jupiter soon leaves it behind, though, so by the 30th it rises 32 minutes before the Sun and is only 6° high at sunrise. Viewed telescopically, its almost full disk is only 10 arcseconds across. The other inner planet, Mercury, moves to lie 26° east of the Sun on the 21st, but hugs the western horizon at sunset and is not observable from our latitudes. This is a slightly-revised version of Alan’s article published in The Scotsman on August 29th 2014, with thanks to the newspaper for permission to republish here. With Scotland’s nights still awash with twilight, many people focus on the Sun during July. There are dangers involved, though, and I don’t just mean sunburn. Specifically, we must never look at the Sun directly through binoculars or any telescope. To do so invites serious eye damage. Instead, project the Sun’s image onto a white card held away from the eyepiece or obtain an approved solar filter to fit over the objective (rather than the eyepiece) end of your instrument. The most obvious features on the solar disk are sunspots, cooler areas that are shaped by magnetic activity and last for a few hours to several weeks. Because the Sun rotates every 27 days with respect to the Earth, spots take two weeks to cross the Sun’s face, provided they survive as long. As I warned last time, though, silvery or bluish noctilucent clouds are sometimes visible low down in the northern quarter of the sky and Scotland enjoyed a nice display on the night of 19-20 June. 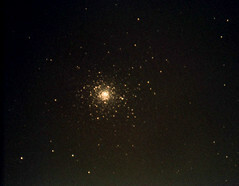 They are formed by ice crystals near 82km and more can be expected until mid-August or so. The Sun tracks 5° southwards during July and from the 12th onwards Edinburgh enjoys at least a few minutes of official nautical darkness around the middle of the night. We need to wait a few days more for the bright Moon to leave the scene, but when it does the fainter stars should once again be visible. 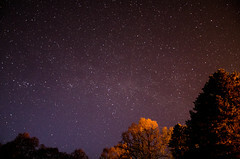 If light pollution is minimal, the Milky Way may be seen arching high across the east at our star map times. 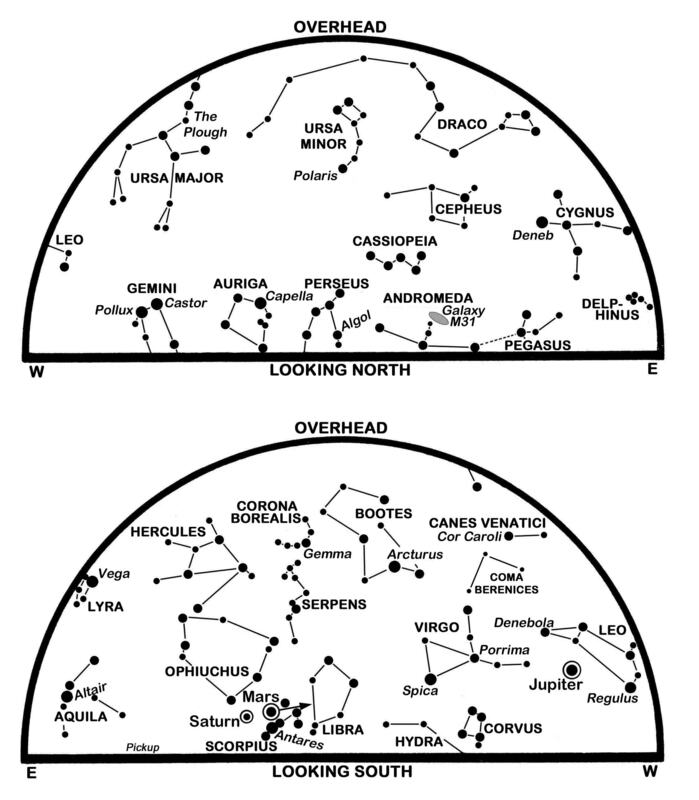 Marking the central plane of our galaxy, with the greater density of distant stars, it stretches from Capella in Auriga in the north through the “W” of Cassiopeia in the north-east before flowing by Deneb in Cygnus in the east and downwards towards Sagittarius near the southern horizon. Where it passes through the Summer Triangle formed by Deneb, Vega and Altair it is split into two by obscuring interstellar dust, the Cygnus Rift. The red star Chi Cygni, 2.5° or five Moon-widths south-west of Eta in the neck of Cygnus, pulsates every 13 months or so between a naked eye object of the fifth magnitude and a dim telescopic one near magnitude 13. It reached an unusually bright peak of better than magnitude four last year and should be near maximum again about now, though recent observations suggest it may not even hit magnitude six this time. The Earth is 152,114,000 km from the Sun, and at its farthest for the year, on the 4th. Sunrise/sunset times for Edinburgh change from 04:31/22:01 BST on the 1st to 05:15/21:22 on the 31st when nautical darkness lasts for almost four hours around the middle of the night. The Moon is at first quarter on the 5th, full on the 12th, at last quarter on the 19th and new on the 26th. Jupiter is barely 6° above the west-north-western horizon at sunset on the 1st and is unlikely to be visible as it heads for conjunction on the Sun’s far side on 24th. Mars, to the right of Spica in Virgo and low down in the south-west at nightfall, sinks to set in the west-south-west at our map times. Fading from magnitude 0.0 to 0.4 this month, it tracks to the left to pass 1.3° above Spica on the 14th – the final and closest of three conjunctions between them this year. The young Moon lies below Regulus in Leo low in the west on the evening of the 1st and close to Mars on the 5th. The 7th finds it close to Saturn and even closer to the double star Zubenelgenubi in Libra, the three making for a superb sight through binoculars. Saturn dims only slightly from magnitude 0.4 to 0.5 and hardly moves against the stars, appearing telescopically as an 18 arcseconds disk with rings 40 arcseconds wide. A brilliant morning star at magnitude -3.9, Venus rises at about 03:00 BST and stands 12° to 14° high in the east-north-east at sunrise. As it tracks eastwards through Taurus, use it as a pointer to Mercury which is less than 8° below and left of Venus from the 10th to the 23rd as it brightens from magnitude 0.8 to -0.8. Set your alarm to catch Venus 8° to the left of the 7% illuminated waning earthlit Moon before dawn on the 24th. While many stars are larger than our Sun, including the vast majority of stars visible to the unaided eye, there are billions that are smaller. Indeed, red dwarf stars, from about half the Sun’s mass to 1/13th as massive, are thought to make up 75% of the more than 100 billion stars in our galaxy. The smallest known star, and probably close to the smallest star possible, is a red dwarf in the constellation Lepus, just south of Orion. Smaller than Jupiter, but more massive, it has surface temperature of 1,800C and a luminosity of 1/8,000th of our Sun so that we need a large telescope just to see it even though it is only 40 light years away. This is a slightly-revised version of Alan’s article published in The Scotsman on July 1st 2014, with thanks to the newspaper for permission to republish here.